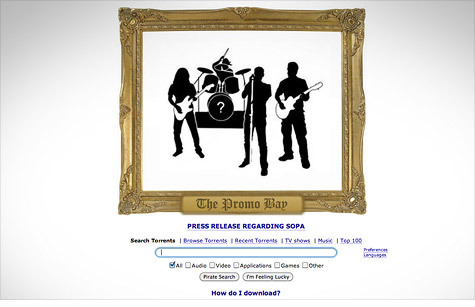 ThePirateBay.org is one of the Internet's most popular trading posts for copyright-protected media like TV shows and movies. NEW YORK (CNNMoney) -- One day after a massive online protest against proposed new anti-piracy laws, federal agents shut down Megaupload, a popular hub for illegal file sharing. Run by an organization registered in the Seychelles, The Pirate Bay bills itself as the "world's largest tracker of BitTorrent files." BitTorrent is a free software program that lets its 150 million users swap and download large media files. The tool has many legitimate uses, but it's also heavily used to illegally trade movies and other copyrighted content. The Pirate Bay can be confusing to those who aren't fluent geeks. Downloading files requires installing and learning to use torrent software, and the site's ad-choked pages aren't easy to understand at a glance. But the system is extremely resilient -- and it's a haven for digital piracy. On Friday afternoon, one day after Megaupload's death, more than 36 million computers were connected to The Pirate Bay's network. Recent episodes of the TV shows "Vampire Diaries," "Big Bang Theory" and "The Mentalist" were among the day's most popular downloads, along with the video game "Call of Duty: Modern Warfare 3" and the just-released movie "War Horse." The Pirate Bay is firmly in the U.S. government's crosshairs. Senator Orrin Hatch, who co-chairs the Congressional International Anti-Piracy Caucus, once denounced it on the Senate floor, and in December, the Office of the U.S. Trade Representative highlighted The Pirate Bay on its list of "markets notorious for privacy." The Pirate Bay simply operates a tracking network, so none of the copyright-protected files users commonly swap ever sit on the site's own servers. That makes it very hard to kill. The site has successfully survived a number of assassination attempts in its nine-year existence. It became a non-profit organization in 2006 -- the same year that brought The Pirate Bay a boatload of legal woes. On May 31, 2006, police raided The Pirate Bay's office in Stockholm and confiscated the site's servers. The site went down for three days -- some users initially thought it was an April Fool's joke -- and temporarily moved its servers to the Netherlands. Protests broke out on the Swedish streets. The Pirate Bay blamed the police raid on the Motion Picture Association of America, which acknowledged to Wired that it had "made criminal complaints" to Swedish authorities. The four were sentenced to one year in jail and a fine of $905,000 each. All except Svartholm, who was ill and skipped his scheduled court appearances, appealed the sentence, and in 2010 it was amended to include less jail time but a higher fine. The case is still ongoing: The three plan to take their battle to Sweden's Supreme Court. Svartholm hasn't been seen publicly in several years. His whereabouts are unknown. "Nobody is in contact with him," Sunde told online news site TorrentFreak late last year. "For all we know he might be dead, since no-one can reach him." '0 torrents will ever be removed': The Pirate Bay's operators aren't fazed by the past legal actions, nor are they ruffled by threats of future lawsuits. They publicly thumb their noses at cease-and-desist letters from copyright holders, some of which are compiled on the site's "legal threats" section. The Pirate Bay's responses to these letters are also posted: merry, expletive-laden missives that deride companies that cite U.S. laws in their complaints. As the site told Dreamworks: "As you may or may not be aware, Sweden is not a state in the United States of America. Sweden is a country in northern Europe. Unless you figured it out by now, US law does not apply here. For your information, no Swedish law is being violated." At the bottom of the Legal Threats page, The Pirate Bay makes its stance even more clear. "For the law firms who don't get the hint above: we used to have a nice graph here, but it's simpler to just say: 0 torrents has [sic] been removed, and 0 torrents will ever be removed."